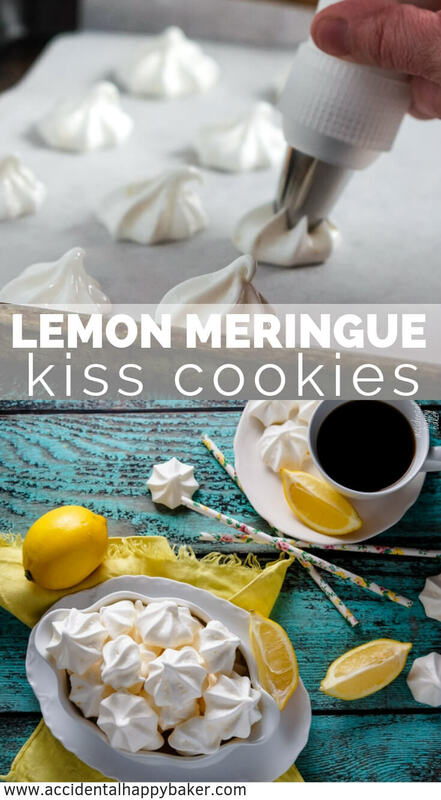 Light as air, little lemony sweet lemon meringue kiss cookies practically melt in your mouth. 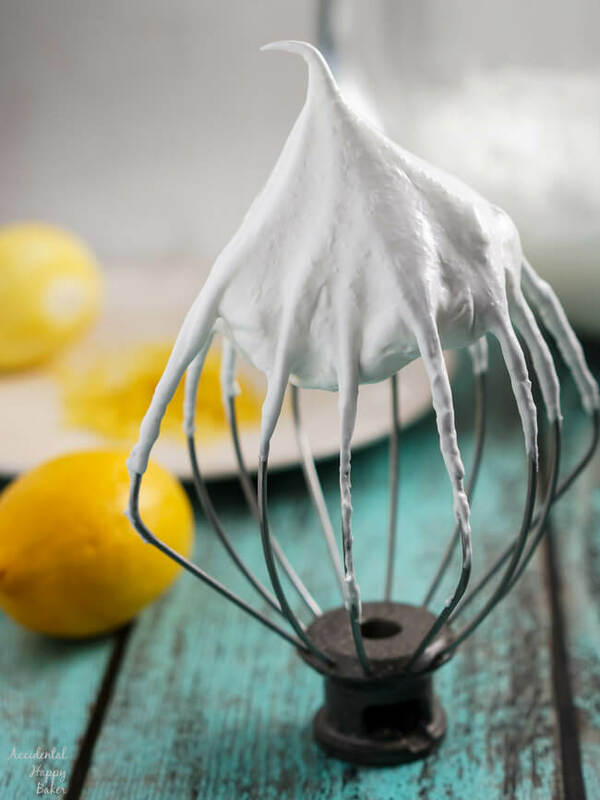 I’ve been trying to tackle sweet, but lighter recipes lately like smoothie parfaits last week and now these lemon meringue kisses. 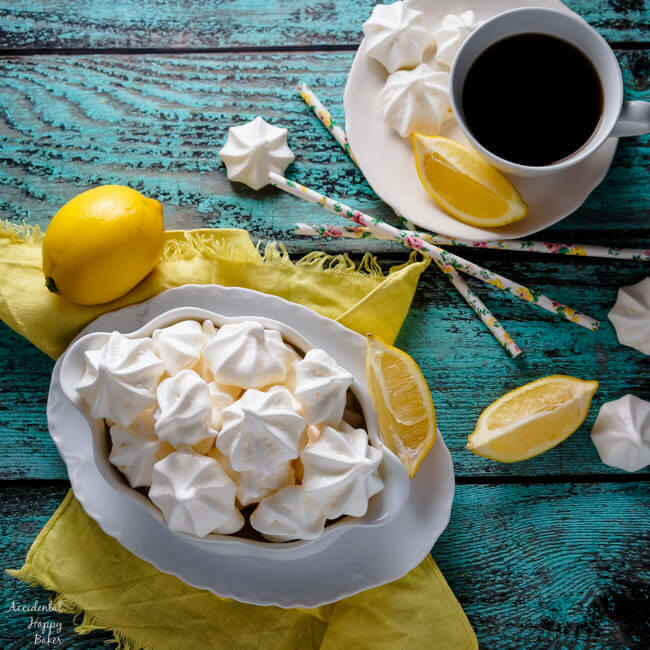 You are going to love these little lemon meringues. For starters, they have such a bright and sunny flavor. I know that I need that right now with temperatures dropping to a -30 windchill this week. Anything that makes me think of spring is welcome in my house. 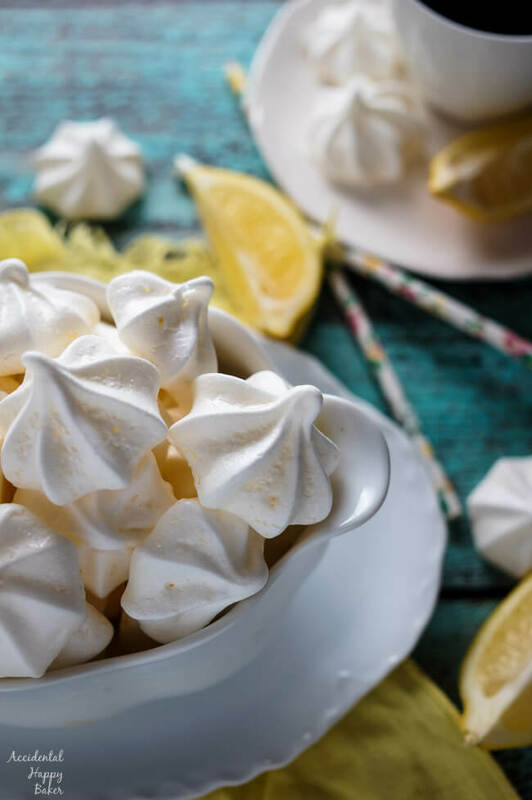 But here’s something you might not know about most meringue cookie recipes, they are naturally gluten free and low calorie! That makes them a perfect lighter option for those of us with a sweet tooth who might have indulged a bit over the holidays and now our pants don’t fit. And when I say “us” here, it’s really just to make me feel better. It’s the perfect time of year for lemons! Winter is the peak season of my favorite sunshiny fruit. Here are a few tips to help you find the best lemons. Look for lemons that are a consistent color. Lemons with green spots were picked too early, while those with dark spots were picked too late or have been sitting on the shelf too long. Fresh lemons will last around 10 days on the counter, but will last up to 3 weeks in the fridge! Store cut lemons wrapped tightly in plastic wrap in the fridge for up to 3 days. Meringue in general has a reputation for being finicky, but these lemon meringue cookies really are pretty easy to make and only require 5 ingredients; lemon zest, egg whites, salt, sugar and cream of tartar. Note: If gluten is an issue for you, stick to a gluten-free cream of tartar such as McCormick, Spice Islands or Durkee brand. Start with room temperature egg whites which will be beaten until soft peaks start to form. See here for more information on the peak stages. Add the sugar slowly giving it a chance to dissolve completely into the egg whites. The goal is to end up with stiff glossy peaks. You’ll know your egg whites are ready when they form peaks that hold their shape when you lift the beaters. Do not over beat your egg whites, they will turn lumpy and watery and once you get to that point they can’t be salvaged. Lightly fold in the lemon zest and gently spoon into a pastry bag with a star tip. We want to keep as much air in the batter as possible. 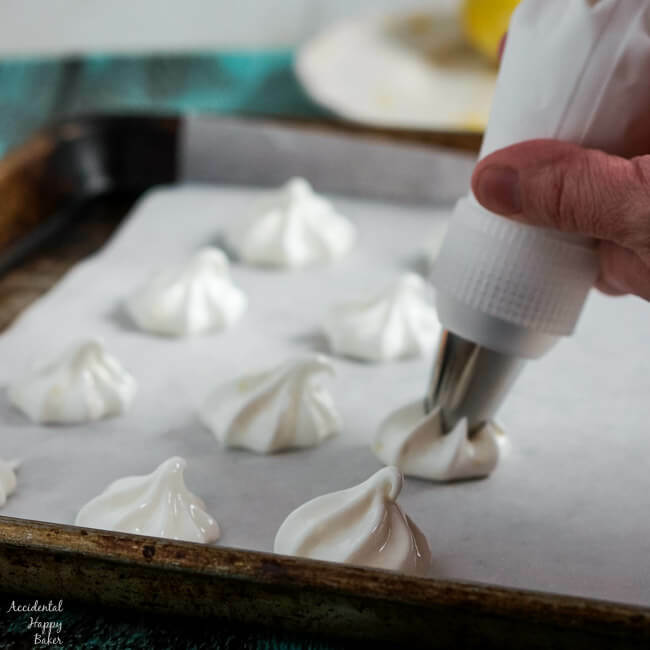 These fun sweet bite sized meringue cookies do have a longer bake time, but once the work is done meringues can be stored in an airtight container up to a month or in the freezer for 3 months giving you a low calorie sweet treat for those times when nothing else will suffice! The above link is an affiliate link. Any Amazon purchases made through this link helps support AHB at no additional cost to you. Light as air, melt in your mouth lemon meringue kisses. Naturally gluten free and only 5 calories a piece! Preheat the oven to 200 degrees and prepare 2 baking sheets with parchment paper. In a medium sized bowl or in your stand mixer, add the egg whites, cream of tartar and salt. Beat on high with your whisk attachment until soft peaks form. When you remove the beater the peaks will be soft and will melt back into themselves. With the mixer still running, add the sugar to the mixture 2 tablespoons at a time, beating until the sugar is completely dissolved. 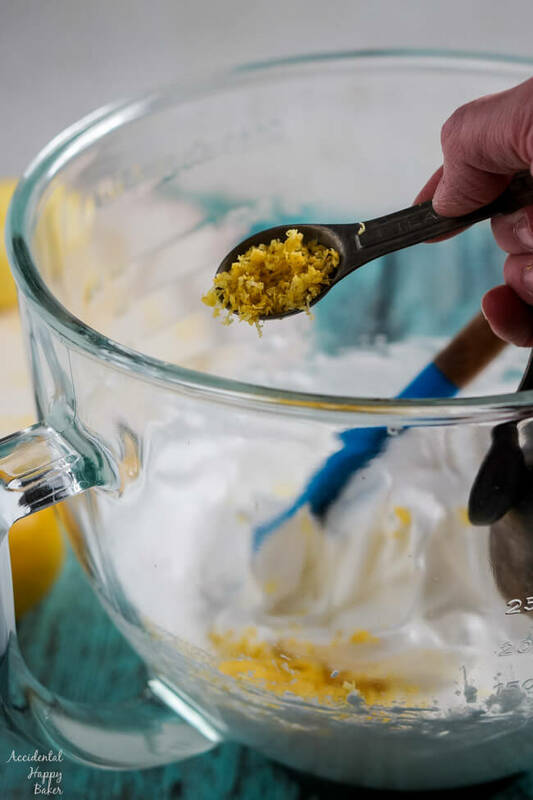 When the sugar has dissolved and the meringue forms stiff, glossy peaks when the beater is lifted turn off the mixer and gently fold in the lemon zest. Spoon the meringue into a pastry bag with an open star tip. Pipe into 1 1/2 inch stars an inch or two apart on the baking sheet. You should be able to pipe around 50 stars from the meringue batter. Bake the meringues for 90 minutes. Switching the baking sheets between the upper and lower oven racks halfway through the bake time. Then turn off the oven, leaving the meringues inside to dry completely for 1 hour. Remove to a wire baking rack and cool completely. Store the meringues in an airtight container for up to a month. Or freeze for up to 3 months.